In India, very-low-birth-weight (VLBW) babies (birth weight <1500 g) constitute only 3.4% of total live births; however, they are responsible for around one-third (29.7%) of the neonatal deaths. The long-term outcome of VLBW babies is affected by prematurity as well as the presence of short-term morbidities such as respiratory distress syndrome (RDS), patent ductus arteriosus (PDA), sepsis, necrotizing enterocolitis (NEC), intraventricular hemorrhage (IVH), periventricular leukomalacia (PVL), retinopathy of prematurity (ROP), and chronic lung disease (CLD). Identification and thence, efforts to modify the factors associated with these morbidities will influence the intact survival of VLBW babies. There are several prospective and retrospective studies from both developing,,,,,,,,,,,, and developed,,,,,, countries regarding the outcome of VLBW babies. However, none of the studies have compared the outcome of VLBW babies with developed and developing countries. Therefore, we planned to compare the outcome of our VLBW babies with both developed and developing countries to identify the birth weight and gestational age bands who are most likely to benefit from timely management, thus allowing the better utilization of available resources and also to decide further intervention required to improve the outcome of other groups. This was a prospective, longitudinal study conducted in a Level II neonatal intensive care unit (NICU) of a tertiary care hospital. The research proposal was approved by the Research and Ethics Committee of the hospital, and the written informed consent was obtained from the parents of enrolled babies. Our neonatal unit is equipped with ventilators including high-frequency ventilator, bubble continuous positive airway pressure, laminar flow, and light-emitting diode phototherapy units. All the babies are provided free medical services under the Janani Shishu Suraksha Karyakram (JSSK) scheme. Babies are admitted to NICU or intermediate care nursery, according to their clinical condition on a first-come- first-served basis, and no special priority is given to VLBW and extremely low-birth-weight (ELBW) infants. All the neonates are provided free medical services, including delivery, NICU care, and mechanical ventilation, under the JSSK scheme. Most of the antibiotics, intravenous lines, including umbilical catheters and central lines, are also available under the scheme; however, parents have to procure the surfactant and total parenteral nutrition constituents from the outside. All the investigations are done free of cost in the hospital itself including newborn screening for the common congenital disorders and karyotyping. In case, the bed is not available in the NICU, the baby is referred to another hospital for intensive care if needed. All live-born inborn babies with birth weight 401–1499 g or gestational age between 22 weeks 0 days and 31 weeks 9 days were included in the study. Stillborn and outborn babies were excluded from the study. The study was conducted over a 9-month period from May 2012 to January 2013. Data were collected prospectively using the standard definitions published by the Vermont Oxford Network (VON). No additional intervention was involved in the study. 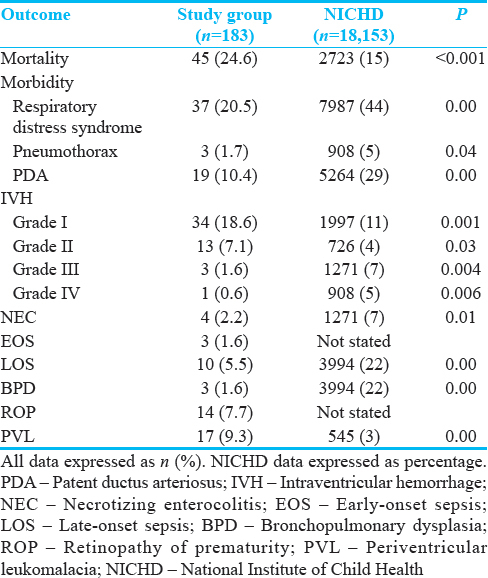 Outcome measures were survival to discharge for VLBW babies, and the incidence of major morbidities, i.e., RDS, PDA, pneumothorax, NEC, gastrointestinal perforation, IVH, PVL, ROP, and CLD. This baseline data related to mortality and morbidity of VLBW babies have already been published elsewhere. Data were also compared to the outcome from VON and the National Institute of Child Health and Human Development (NICHD) data, which is being discussed here. Data were entered in a Microsoft Access database and analyzed with Stata 11.1 software (StataCorp, TX, USA). Categorical data are presented as number and proportion. Numerical data are presented as mean ± standard deviation or median and interquartile range. Mortality and morbidity of VLBW babies were compared to published data of VON and NICHD. P < 0.05 was considered statistically significant. A total of 183 VLBW babies were included in the study period; of these 86 were boys, and 97 were girls, and 121 (66.1%) babies survived to discharge home (45 babies died, 13 left against medical advice during the treatment, and 4 referred to another hospital). The mean birth weight was 1228 g with mean gestational age of 31 weeks, 28.4% of babies were small for gestational age. The outcome of VLBW babies has been compared with VON in [Table 1]. Compared to 24.6% for study participants, mortality was significantly lower for VON group (12.5%), P < 0.001 whereas rates of survival with major morbidity were lower in the study group (34.7% vs. 41.4%), both overall and individually for late-onset sepsis, NEC, bronchopulmonary dysplasia, and severe IVH. However, survival with PVL was significantly higher in the study group (17% vs. 2.7%; P < 0.001). There was no statistically significant difference in the rates of early-onset sepsis (EOS) and severe ROP among survivors. On comparing standardized mortality ratios for individual birth weight bands [Table 2], mortality rates are significantly higher in the study group for each weight-band difference, greatest for babies <750 g (difference 63.4%, 95% confidence interval 4.32%–1.14%) and lowest for 1250–1499 g (difference 9.65%, 95% confidence interval 5.73%–1.67%). VLBW outcome data have also been compared to NICHD data in [Table 3] and [Table 4]. Similar to VON, mortality rate is significantly higher in study participants as compared to NICHD data (24.6% vs. 15%, P < 0.001) and rates of major morbidity are significantly lower in the study population (P < 0.05) except for IVH Grade I and Grade II and PVL for which rates were significantly higher for the study group (P < 0.05). Similarly, survival with major morbidity was significantly higher for the NICHD group as compared to the study population. 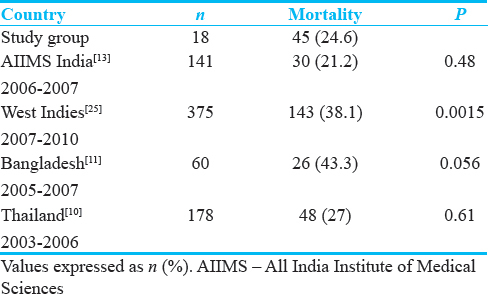 However, on comparing our data with All India Institute of Medical Sciences (AIIMS) [Figure 1] and [Table 5], there was no significant difference in mortality between the two centers (P = 0.26). Similarly, when compared to other developing countries, mortality rates of study participants are comparable to the ones reported from Thailand (P > 0.05) and much lower than the data reported from West Indies (P < 0.05) and Bangladesh (P = 0.056). VLBW babies demand efficient, high technology perinatal services, and consume a significant proportion of health resources. Hence, the outcome of these babies closely reflects the organization of perinatal services and quality of neonatal intensive care. We did a prospective, longitudinal observational study, wherein all live-born VLBW babies born over 9-month period during 2012–2013, were observed for mortality and major morbidity, and data were compared to the results from developed as well as developing countries. 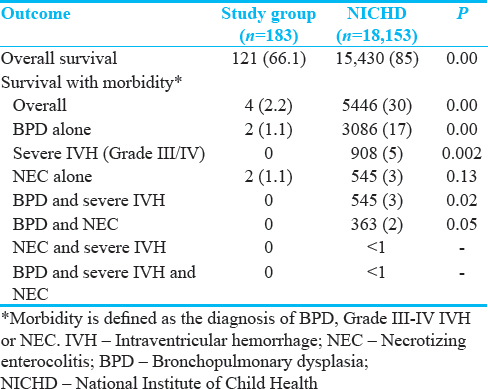 Overall, mortality of VLBW babies is much higher than that of developed countries (24.6% for study participants vs. 15% for NICHD and 12.5% for VON babies) whereas survival with major morbidity is much lower for study participants than VON and NICHD groups. This might be because of decreased survival of ELBW babies (birth weight <1000 g) in this study. In VON group, 63.4% of babies with birth weight <750 g survived to discharge home whereas in our study none of the babies in this weight band survived. Another important factor maybe higher use of antenatal steroids (60% against 79% reported from developed countries, although higher than that reported from other developing countries, 48%). The role of corticosteroids before preterm birth in reducing neonatal mortality and morbidity has already been emphasized by the Cochrane Collaboration. The study group had significantly higher incidence of PVL (9.3%) as compared to developed countries (~3%)., It is already known that IVH, intrauterine infection, and immature cerebral blood flow autoregulation predispose the preterm brain to white-matter injury and subsequent development of PVL. Hence, to some extent, this difference might be explained by higher incidence of EOS reflecting intrauterine infection (2.5% vs. 1.7%) and slightly higher percentage of babies with IVH Grade I to Grade IV (29% vs. 27%). 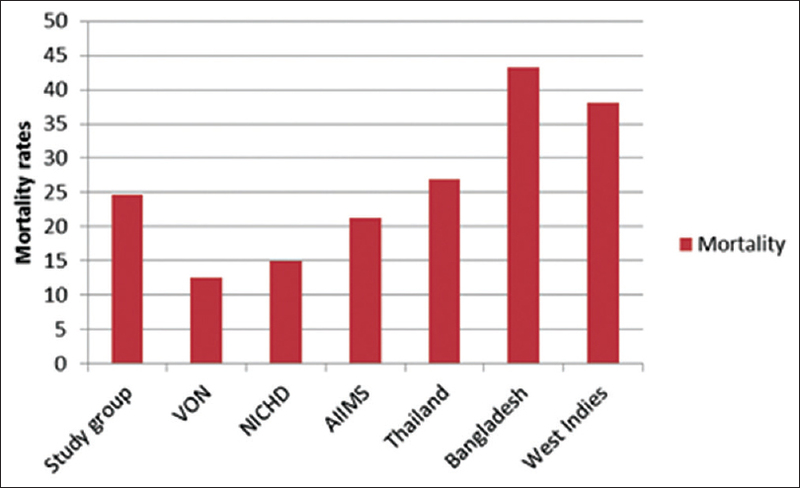 Although we underperformed when compared to developed countries, mortality rates reported in our study are quite close to those of AIIMS (P = 0.48) and definitely lower than the reported rates from other developing countries, namely West Indies and Bangladesh. From this data, we inferred that current outlook is also positive when compared to other developing nations, although there is a definite scope for improvement in the perinatal care of VLBW babies to reach the bar set by developed countries. This is the first prospective study from India comparing the outcome of VLBW babies in detail with results from two large neonatal research networks from developed countries, i.e. VON and NICHD. Mortality rates have also been compared to the latest available data from other developing countries as well as AIIMS which is an institute of excellence with efficient perinatal services. Higher mortality rates for ELBW babies suggest the need for improvement in perinatal care and more aggressive approach to their management to improve the overall outcome of VLBW infants. As each additional week of gestation is associated with improved survival and reduced cost of treatment, prolongation of gestation in these patients seems to be a cost-effective intervention. However, this study is limited to the short-term outcome of VLBW babies. Due to time constraint for thesis completion, we could not include the neurodevelopmental outcome of these babies at 18 months and 5 years. This study provides a baseline information for establishing more comprehensive and preferably, multicentric database for evaluating the outcome of very-low-birth infants and study the regional differences in their outcome. This study also indicates that we are quite close rather better than other developing countries regarding the outcome of our VLBW babies, although there is a definite scope for improvement compared to the developed world. However, further large-scale trials are required to substantiate our findings and also to study the neurodevelopmental outcome of these babies. National Neonatology Forum of India. National Neonatal Perinatal Database. Report 2002-03. New Delhi: National Neonatology Forum of India; 2002-03. p. 1-70. Chedid F, Shanteer S, Haddad H, Musharraf I, Shihab Z, Imran A, et al. Short-term outcome of very low birth weight infants in a developing country: Comparison with the Vermont Oxford Network. J Trop Pediatr 2009;55:15-9. Boo NY. Outcome of very low birth weight neonates in a developing country: Experience from a large Malaysian maternity hospital. Singapore Med J 1992;33:33-7. Mansouri HA. Perinatal factors and neonatal outcome of very low birth weight and extremely premature babies at KAUH. Bahrain Med Bull 2001;23:66-70. Duman N, Kumral A, Gülcan H, Ozkan H. Outcome of very-low-birth-weight infants in a developing country: A prospective study from the western region of Turkey. J Matern Fetal Neonatal Med 2003;13:54-8. Atasay B, Günlemez A, Unal S, Arsan S. Outcomes of very low birthweight infants in a newborn tertiary center in Turkey, 1997-2000. Turk J Pediatr 2003;45:283-9. Velaphi SC, Mokhachane M, Mphahlele RM, Beckh-Arnold E, Kuwanda ML, Cooper PA, et al. Survival of very-low-birth-weight infants according to birth weight and gestational age in a public hospital. S Afr Med J 2005;95:504-9. Obaid KA, Al Azzawi DS. Outcome of low birth weight infants in Diyala province of Iraq. J Trop Pediatr 2011;57:280-2. Sritipsukho S, Suarod T, Sritipsukho P. Survival and outcome of very low birth weight infants born in a university hospital with level II NICU. J Med Assoc Thai 2007;90:1323-9. Chanvitan P, Ruangnapa K, Janjindamai W, Disaneevate S. Outcomes of very low birth weight infants in Songklanagarind Hospital. J Med Assoc Thai 2010;93:191-8. Ahmed A, Rob MA, Rahman F, Rahman R, Huda N. Preterm very low birth weight babies: Outcome of admitted newborns at a community level medical college hospital in Bangladesh. J Bangladesh Coll Phys Surg 2008;26:128-34. Al Hazzani F, Al-Alaiyan S, Hassanein J, Khadawardi E. Short-term outcome of very low-birth-weight infants in a tertiary care hospital in Saudi Arabia. Ann Saudi Med 2011;31:581-5. Roy KK, Baruah J, Kumar S, Malhotra N, Deorari AK, Sharma JB. Maternal antenatal profile and immediate neonatal outcome in VLBW and ELBW babies. Indian J Pediatr 2006;73:669-73. Sehgal A, Telang S, Passah SM, Jyothi MC. Maternal and neonatal profile and immediate outcome in ELBW babies. Indian Pediatr 2003;40:991-5. Horbar JD, Carpenter JH, Badger GJ, Kenny MJ, Soll RF, Morrow KA, et al. Mortality and neonatal morbidity among infants 501 to 1500 grams from 2000 to 2009. Pediatrics 2012;129:1019-26. Lemons JA, Bauer CR, Oh W, Korones SB, Papile LA, Stoll BJ, et al. Very low birth weight outcomes of the National Institute of Child health and Human Development Neonatal Research Network, January 1995 through December 1996. NICHD neonatal research network. Pediatrics 2001;107:E1. Holt J, Weidle B, Kaaresen PI, Fundingsrud HP, Dahl LB. Very low birthweight infants: Outcome in a sub-arctic population. Acta Paediatr 1998;87:446-51.
de Vonderweid U, Spagnolo A, Corchia C, Chiandotto V, Chiappe S, Chiappe F, et al. Italian multicentre study on very low-birth-weight babies. Neonatal mortality and two-year outcome. Acta Paediatr 1994;83:391-6. Darlow BA, Cust AE, Donoghue DA. Improved outcomes for very low birthweight infants: Evidence from New Zealand national population based data. Arch Dis Child Fetal Neonatal Ed 2003;88:F23-8. Grupo Colaborativo Neocosur. Very-low-birth-weight infant outcomes in 11 South American NICUs. J Perinatol 2002;22:2-7. Moro M, Pérez-Rodriguez J, Figueras-Aloy J, Fernández C, Doménech E, Jiménez R, et al. Predischarge morbidities in extremely and very low-birth-weight infants in Spanish neonatal units. Am J Perinatol 2009;26:335-43. Manual of Operations Part 2: Data Definitions and Data Forms for Infants Born in 2012. Vermont Oxford Network Database; Vol. 16.3. 2012. p. 1-91. Bansal A, Chawla D. Mortality and morbidity profile of preterm very low birth weight infants. A prospective longitudinal observational study. Indian J Child Health 2017;4:225-30. Fanaroff AA, Stoll BJ, Wright LL, Carlo WA, Ehrenkranz RA, Stark AR, et al. Trends in neonatal morbidity and mortality for very low birthweight infants. Am J Obstet Gynecol 2007;196:147.e1-8. Trotman H. Review of mortality of very low birthweight infants at the university hospital of the West Indies over the past four decades. West Indian Med J 2012;61:356-60. Crowley P. Prophylactic corticosteroids for preterm birth. Cochrane Database Syst Rev 2006;(3):Art. No.:CD000065. DOI:. 10.1002/14651858. CD000065. Pub2.